With Halloween fast approaching the stores are now filled with candy, costumes and decorations! And although I don’t have little ones around the house now, I still like to make special treats for favorite little neighbors! 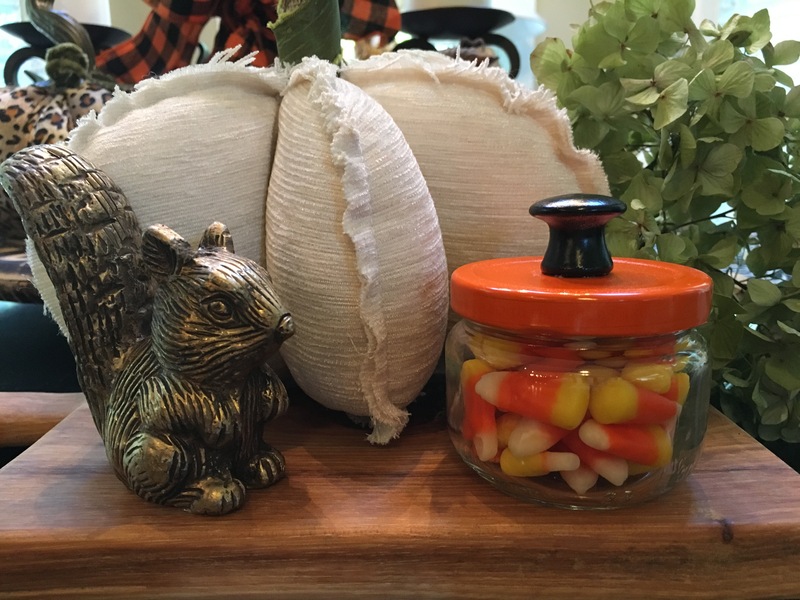 These Halloween candy jars are super quick and easy! I love to save glass jars of all shapes and sizes. There are a million uses for them too! For this project I used 4 ounce pimento jars and garlic jars. These are great because they usually don’t have a label on the side or top making them very easy to clean. No scraping or soaking. I wash them out well and run them through the dishwasher on an extra hot wash cycle and the smells usually come right out. (especially the garlic) Sometimes I soak them in dish liquid and hot water prior to the dishwasher cycle for extra precaution. I do the same process for all of my projects that contain garlic, pickles, etc. like this one for a Candy Jar, or this one for a Treat Jar for Pets! I cleaned the lids and jars and I painted the lids with orange Rustoleum spray paint. I love orange during halloween! I get very “in the spirit” when it comes to Halloween Decorating Ideas. As those were drying I painted some small wooden knobs black in a satin finish. (also by Rustoluem). I think these turned out really cute! They are glass and therefore breakable, so caution is key. I think it’s important for children to learn how to take care of things and be careful with breakables. What better way to teach them than with a cute little candy jar just for them? I have found that these are also the perfect accent for all of my various Halloween and Fall-Themed displays! Any sort of candy would work great for these jars and would make great gifts, too! The children could help fill them and decorate the jars with fun little stickers! These were so quick and simple to make and inexpensive too! They look cute with or without a ribbon. There are so many possibilities! Happy Fall, Y’all! This is adorable &I quite creative!!!? What glue did you use to,attach the knob?? Thank you, Cindy! I used E6000 glue. It’s great! Thank you! I used E6000 glue. These are adorable! Instead of a knob on top you could paint a Jack-O-Lantern face. This would make it easier for little hands to open the lid. The knob would make it harder for them to grasp it when opening. Thank you, Jane! Great idea about painting the top!